It took a power saw to cut the fingernails of the man with the longest set in the world last week, and it was all caught on video in New York. A new exhibit has opened at Ripley's Believe It or Not! in Time's Square after the world's longest fingernails were sold to the establishment by the record holder. 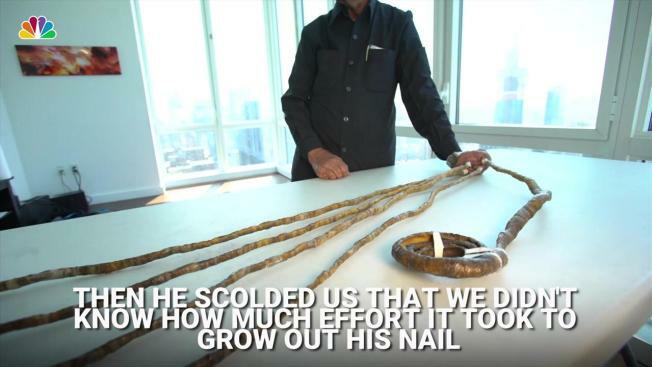 Last week, Shridhar Chillal was flown out from India to New York City by Ripley's to have his fingernails cut for the first time since 1952. Chillal's nails are over 31 feet long and are now memorialized forever in the display case at Ripley's. He grew out the nails on only his left hand, leaving it permanently handicapped from the weight and positioning. He can't flex his fingers or open his hand from the closed position. Dr. Mark Bornstein, an expert in nail conditions, examined Chillal when he came to America. Bornstein told Ripley's Believe It or Not! that he is confident Chillal's nails can grow normally again after the cutting. A professional used a small circular saw to cut off the nails, which was documented in the video above. Chillal works as a government press photographer in India. He said he wanted to show people he could do a two-handed job just as well, if not better, with only one hand. As a teen, Chillal got in trouble by one of his teachers at school. Chillal had accidentally broken the teacher's long pinky nail and he didn't understand why the teacher was so upset. His teacher told him he couldn't understand the consequence as sincerely because he had never committed to anything seriously before. This sparked the idea for Chillal to grow out his nails. "I took it as a challenge," Challal said.